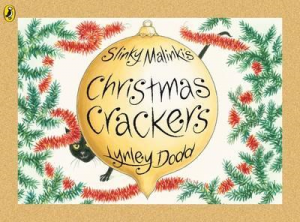 Slinky Malinki and his friends get into all sorts of trouble in this chuckle worthy Christmas story. Written by Lynley Dodd, Slinky Malinki Christmas Crackers is a rhyming story and an excellent one to practice early phonological awareness skills with. Encourage your child to use rhyming words by taking turns to read the story together, for example you might read ‘hanging up high was a lollipop drop, and the Christmas tree fairy sat right at the…?’ and then pause for your child to try to work out the last work (‘top’). If your child isn’t sure, encourage them to look at the pictures to give them clues. Play ‘Bring Me A Rhyme’ – a version of ‘Eye Spy’ for older children – where you ask your child to bring you something that rhymes with your word, for example ‘bring me something that rhymes with tree…’ and your child could bring you a key or some tea. Make predictions about what will happen next in the story before you turn each page, for example what might happen if Slinky Malinki climbs up the Christmas tree? Decorating your Christmas tree is an excellent way to learn about prepositions and other adjectives. You could hang up all of the shiny baubles first, then decorations at the top, middle or bottom, and then something that rings (e.g. a bell) and something that shimmers (e.g. tinsel). There is SO much vocabulary you can include in your instructions to make your decorating not only fun, but excellent listening practice too!